Inspired by a trip to Ethiopia with World Vision’s 30 Hour Famine program in August of 2013, Jenna Blodgett is a teenager that knows she wants to make a difference. Beyond that, she is making a difference. While influenced by her trip, Jenna realizes that she does not have to go to Africa to have an impact. Jenna has influenced nearly 150 people to send letters to their congressional representative about the Water for the World Act, traveled to Washington, D.C.; to speak with members of Congress about issues that affect the poor; and, just this last weekend, she ran 26.2 miles to raise awareness about the lack of clean water while raising money for the cause. From Ethiopia to D.C. and D.C. to Chicago — here’s Jenna’s story! Six months ago, I was fortunate enough to attend the H2O:DC conference in Washington D.C.. We spent two days learning, teaching and advocating for clean water and the Water for the World Act. I learned about the real need for clean water, how big of an issue it really is and how easy it is to make a change. During dinner on the first night, Steve Spear spoke to us. For those who don’t know, Steve Spear ran from Los Angeles to New York City raising money the whole way for Team World Vision. That totals up to 150 marathons in a row! Long story short, it was the most inspirational presentation I’ve ever seen. Throughout his presentation he tried to convince the audience that we should all sign up for a marathon, and I knew from that moment on he was crazy—there was no way I would ever run a marathon. After a cpouple of long days at the conference, I arrived at the airport to head home just to realize that God had a plan for me, and he wasn’t going to let me forget it. I walked up to my gate, and the first person I saw was Steve Spear sitting right there waiting to board the same flight back to Chicago. After a two-hour conversation at Reagan National Airport with Steve, I had agreed to run the Chicago Marathon in the fall. This past weekend I completed the Chicago Marathon and I raised $1,775. My team, which included four close friends also involved with World Vision, raised a total of $9,670. 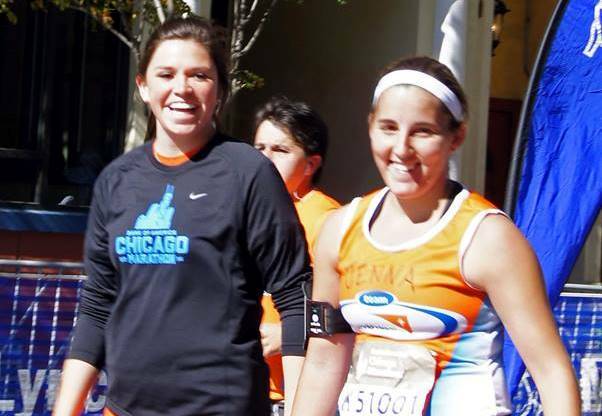 The total from Chicago’s Team World Vision at the marathon raised $1,277,877. That means that we have provided clean water for 25,557 people for a lifetime — just from this one race! When I left D.C., I wasn’t sure that I could actually make a difference with the water crisis. How could running prevent innocent children from dying? But every mile I ran, I provided life for one more kid; a future that wasn’t going to be stolen from water-related diseases. Clean water is a basic necessity that everyone should have access to. Running the marathon was the best decision I’ve made in my whole life. After completing it, I know that the goal for everyone to have access to clean water is attainable. We can solve this issue; we all just have to work together. I plan to continue to raise awareness for clean water, and I hope that someday it won’t be something anyone has to fight for. Want to do your part without running a marathon? Email your members of Congress and ask them to support clean water by cosponsoring the Water for the World Act. Go one step further and in less than two minutes you can call your representative’s office. We will give you the phone number, call script, and everything else you need!. ← How About an #AwesomeDuck Session?